The idea: People who know people at the company they’re applying to get hired more often than people who don’t. 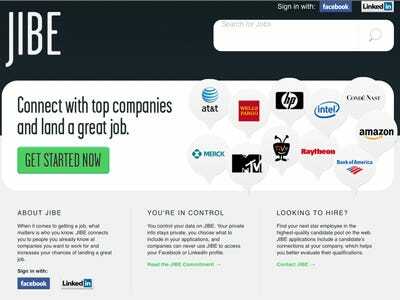 JIBE, an online social recruiting business, helps you find those connections and attach them along with your cover letter and resume when you apply for jobs online. The job seeker clicks on the opening and fills out the application. Before the application can be submitted, the user must login to Facebook and LinkedIn. JIBE pulls together each contacts’ work and education histories using Facebook Connect and LinkedIn. People who currently work at that company and are connected to the job seeker appear. The job seeker can then “add them” to their application. The employer will get a note saying who the prospective employee knows within the company. Whose idea: Joe Essenfeld, JIBE founder and CEO. Why this idea is brilliant: JIBE simplifies the task of searching through your contacts’ work histories and asking for referrals. In terms of privacy issues, JIBE says it only displays public information that is not blocked off and it will not list the information of your friends’ friends. The only issue we really see is this: What if you say you know someone at the company but the hiring manager dislikes that particular colleague? Negative connections seem very possible. “We don’t meddle in personal issues,” Essenfeld told us. “But the few times that a negative connection has happened, we’ve sent back a personal email suggesting the employer no longer remains connected with that contact online.” Easy enough.